The Patek Philippe Gondolo collection contains watches of all shapes and sizes. 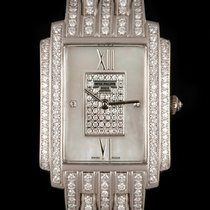 These Art Deco dress watches are available with rectangular or barrel-shaped cases and complications such as a moon phase display or power reserve of up to eight days. 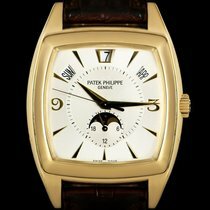 Patek Philippe introduced the Gondolo in 1993, making it a somewhat newer collection from this luxury watch manufacturer. The Calatrava, in contrast, has been around since 1932. However, that doesn't mean the Gondolo lacks traditional Patek roots. Its history goes back many decades. The Gondolo name pays homage to Patek's successful collaboration with Brazilian watch dealer Gondolo & Labouriau, which began in 1872. The cooperation between Patek and Gondolo & Labouriau lasted 55 years, ending in 1927. At that time, the Art Deco movement was in full swing. The Gondolo collection perfectly embodies what Art Deco stood for: elegance, boldness, and drama. The watches are available with both rectangular and pillow-shaped cases, which are made exclusively of precious materials such as gold or platinum. Some designs are more subdued, while others are particularly luxurious and feature diamonds and pearls. The hour markers also differ: There are models with Breguet numerals arranged in an oval and others with minimalist indices. In keeping with the collection's nostalgic nature, these timepieces are often paired with cow or crocodile leather straps. Gold bracelets are less common. The beautiful exteriors are a reflection of the fantastic technology held within. In-house calibers tick away inside these watches, providing them with an eight-day power reserve or complications like a moon phase or annual calendar. Up until 2009, every caliber came with a Genevan seal. Patek Philippe have since introduced their own quality seal. Unlike the Genevan Seal, Patek's certification only tests watches once they are fully assembled. How much does a Gondolo cost? A Gondolo is a great choice for fans of uniquely shaped watches. They are stunning alternatives to other famous non-round watches like the Cartier Tank and the Jaeger-LeCoultre Reverso. These dress watches pair beautifully with an elegant suit or evening wear. If you prefer barrel-shaped watches, you may enjoy the Gondolo with the reference number 5098. Its large Breguet numerals and gold, hand-guillochéed dial are clearly inspired by the Art Deco movement. The 5098 features hour and minute hands and the manual caliber 25-21-REC. Its case measures 32 mm x 42 mm and has a domed sapphire glass case back. You can purchase a well-maintained 5098 in rose gold for around 23,400 USD. Prices for platinum models begin around 29,300 USD. The reference number 5030 also has a barrel-shaped case. However, unlike the 5098, it is a three-hand watch and comes with a practical date display at 3 o'clock. Its Arabic numerals are less ornate than those of its sister model and follow the case shape around the edge of the dial. A white gold version of this Gondolo sells for around 10,500 USD in very good condition. Compared to the 5098, the men's watch with the reference number 5124 has a rather modern design. This is enhanced by its dauphine hands and line indices. A never-worn white gold model demands around 23,400 USD. The 5124 also offers a view of the movement through its sapphire glass case back. Furthermore, it features a small seconds dial at 6 o'clock. The 5200 closely resembles the 5124, but is more luxurious thanks to its complications. The lower half of the dial has a window for the day as well as a pointer date with a 1-31 scale. On the upper half of the dial, a power reserve display indicates how much of the eight-day power reserve remains. The white gold edition comes with a blue or white dial and costs around 46,800 USD in mint condition. If you're looking for a women's Gondolo watch, you will find an extraordinary number of pre-owned gold examples for under 11,600 USD. Most of these watches are quartz-powered, which keeps their prices relatively low. The most expensive women's models use mechanical movements and are lavishly covered in diamonds. For example, the dial and case of the 7099 feature a combined 847 diamonds. Set aside between 81,900 and 117,000 USD for one of these timepieces. The reference number 7042 combines diamonds and pearls on its case and bracelet. Its white or rose gold case houses the manual caliber 215. The dial alone is encrusted with 263 diamonds, and an impressive 78 Akoya pearls adorn the bracelet. This type of pearl is characterized by its shine and even round shape. 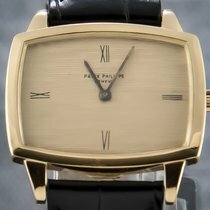 The list price for this luxurious Patek Philippe sits at 178,540 euros (around 209,000 USD). Pre-owned examples are rare and, therefore, sell for similar prices. The Gondolo Calendario with the reference number 5135 feels very modern thanks to its sharp hour indices that run from the edge to the middle of the dial. These indices surround the minute scale, within which a moon phase display sits at 6 o'clock. Arabic numerals mark the hours at 3 and 9 o'clock. The practical annual calendar means you only have to manually correct the date display once a year since it can't account for February's shorter length. In addition, there is a day display at 11 and a month display at 2 o'clock. The platinum edition with a silvery-gray dial is especially masculine and costs around 37,500 USD in very good condition. The beginning of the Gondolo's history can be traced back to November 12, 1872. 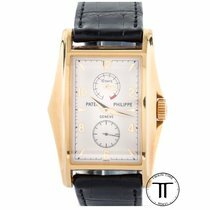 It was on this day that Patek Philippe began collaborating with the Brazilian wholesaler Gondolo & Labouriau. 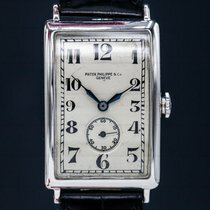 A third of all Patek Philippe watches were sold in South America via this partnership towards the end of the 19th century. Some 120 years later, Patek would name a collection in tribute to this vital part of their history. 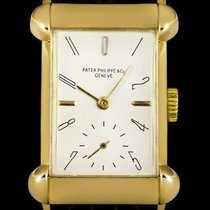 Rich Brazilians loved to wear Patek Philippe watches as status symbols. This resulted in the so-called "Gondolo Gang," a group of rich watch lovers. The gang was comprised of individual clubs, each with 180 members. In 1907, there were a total of 54 clubs in Brazil. Members wore large, straw hats with "PATEK" written on the front to distinguish themselves as a member. Owning a Patek Philippe was a way for someone to show off their social status and success, and members of the Gondolo Gang were the only ones who could purchase a Chronometro Gondolo. An ingenious sales strategy boosted revenues. In the Plano do Club Patek Philippe System, the members could pay for their watches in installments. One watch cost 790 Swiss francs, and every week members would pay 10 francs. If you were one of the unlucky ones, you'd pay 10 francs for 79 weeks. However, there was also a weekly lottery set up by Gondolo & Labouriau. If your name was drawn, then you didn't have to finish paying for your watch. With a little luck, many people were able to get their Pateks more or less for free—a pretty enticing offer.